30 for 30, day 22. Questions. I can’t tout the cool effect of purple and green enough! Behold the natural hand pose. Definitely not what my hands do of their own volition. A scarf instead of a necklace? Yes! Questions such as, “why are you dressed like The Joker?” That’s what my husband asked me this morning. It takes a sense of humor to live in our household. I have an answer, of course. It’s day 22 and I’m trying not to replicate any outfits while being burdened with the task of wearing the stylish equivalent of the post-Thanksgiving muumuu. No easy feat to achieve, fellow remixers know, every day gets a little more challenging. Certain that I have gained 15 “micro-pounds,” I needed to stay away from All Things Fitted for the next several days while I digest the last remaining tidbits of my two Thanksgiving dinners. Micro-pounds are the make-believe weight one truly feels like they’ve gained in a very short amount of time, there’s no such thing; it’s not physically possible to gain that much weight in, let’s say, two days. I make words up all the time. Oh, but that weight feels real, my friends. Hence the soft flounce of my stretchy purple dress cleverly disguised as a skirt. I’m not above being sneaky if it means I get one more outfit. Extra points when it’s comfortable. 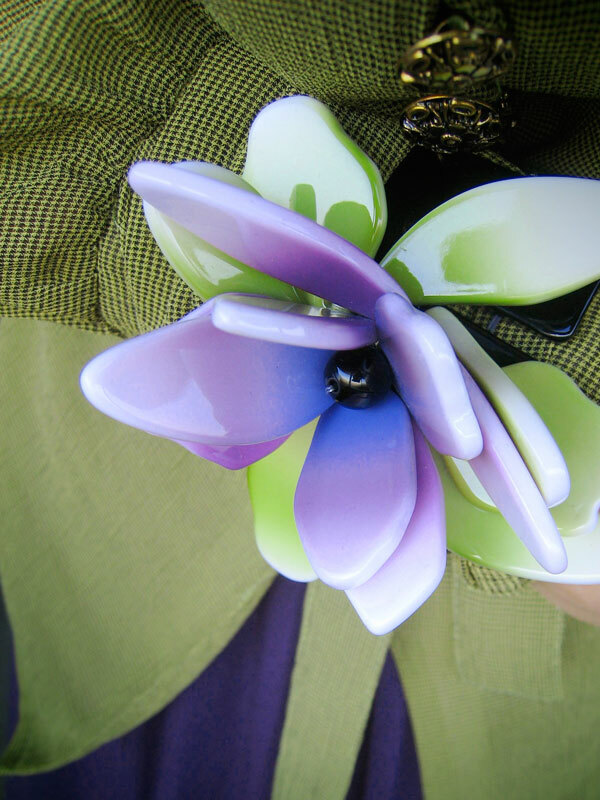 Extra, extra points for mixing purple and chartreuse. 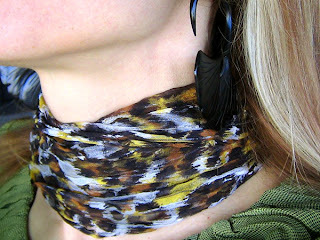 Notice the snazzy accessorizing: Gauzy leopard-print scarf revealed through my hair, draping down my back. And that bracelet, that brilliant scene stealer! My co-workers are finally getting used to it and are no longer mentioning it with the same level of wonder and awe as when I first introduced it last year. Deets: Purple dress/BP, Nordstrom’s, chartreuse blouse/ModCloth, purple tights/Hue, leopard-print scarf/unknown, bracelet/Anthropologie, black hand-carved gingko earrings/Braindrops, brown man-made suede boots/Munro.